KLS was recently contracted to remove an underground storage tank (UST) that was used to collect and store waste oil at a fire station. Though the tank was no longer in use, appropriate procedures and practices must be utilized for the safe and effective removal of the tank prior to backfill of the former tank nest. KLS successfully evacuated the tank, washed the tank, and performed the removal and destruction of the tank using a certified PTMAA tank remover. The tank was immediately located next to the main structure of the building. 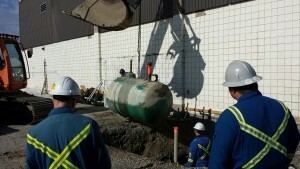 Special care and procedures were required to ensure the building and connected components were not damaged during the tank exposure, removal, and backfill – adding an additional layer of complexity to the project. Upon removal of the tank, KLS worked with the environmental consultant to collect samples for the on-site and laboratory testing of the soil from the walls and base of the excavation. KLS personnel working within the excavation area were equipped with 4-gas monitors to continually monitor flammable vapours to ensure safe work. The project showcased the ability of KLS to work in areas that require surgical excavation procedures coupled with the task of managing material and components containing flammable/hazardous substances. For more information on this project, or to discuss how KLS can help you with your UST removals/remediation, please contact a representative via phone or email.